When one questions what he or she feels like eating and thinks, “Hmm, do my tastebuds crave something sweet? Savory perhaps? Or both?” The answer is always: Peanut Butter. Just straight up peanut butter. Grab the jar. Grab a spoon. And just eat it by the spoonful. You won’t regret it. Well, I take that back. A terrible stomach ache may lead you to think twice about why you took that 5th spoonful…or that 6th spoonful. But regardless, peanut butter is amazing and for all of my friends allergic to peanuts; I am deeply sorry for your loss. 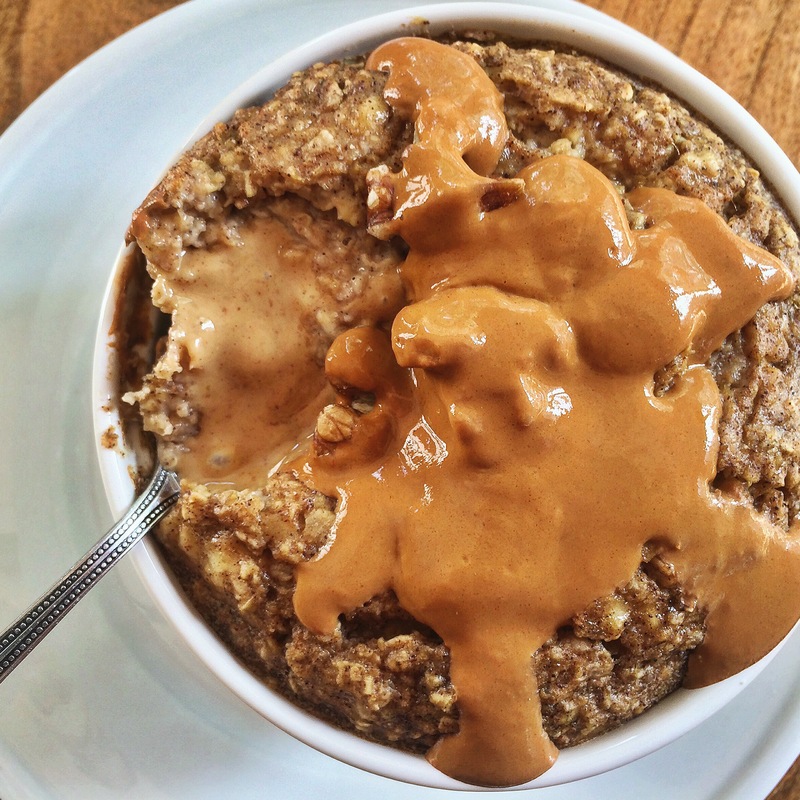 If you love peanut butter just as much as I do, and therefore, would love nothing more than to dig into a jar of deliciousness as soon as you get out of bed in the morning, then you must try this baked oatmeal. Let me know what you think! And shout-out to my Daddyo for being the best dad out there! Happy Father’s Day from afar! In a small bowl slice a banana into pieces and then mash. In another small bowl, mix together baking soda, salt, nutmeg, cardamom, cinnamon and oats. Then add in milk, vanilla extract and mashed banana. Combine until mixed. Spoon half of the oatmeal mixture into a small ramekin. Then take two heaping tbsp. of peanut butter and press into the middle of the mixture. Top with remaining oatmeal mixture. Place ramekin on top of a baking sheet and bake in the oven for 20 minutes. Meanwhile, heat caramel syrup in a small saucepan on low heat. 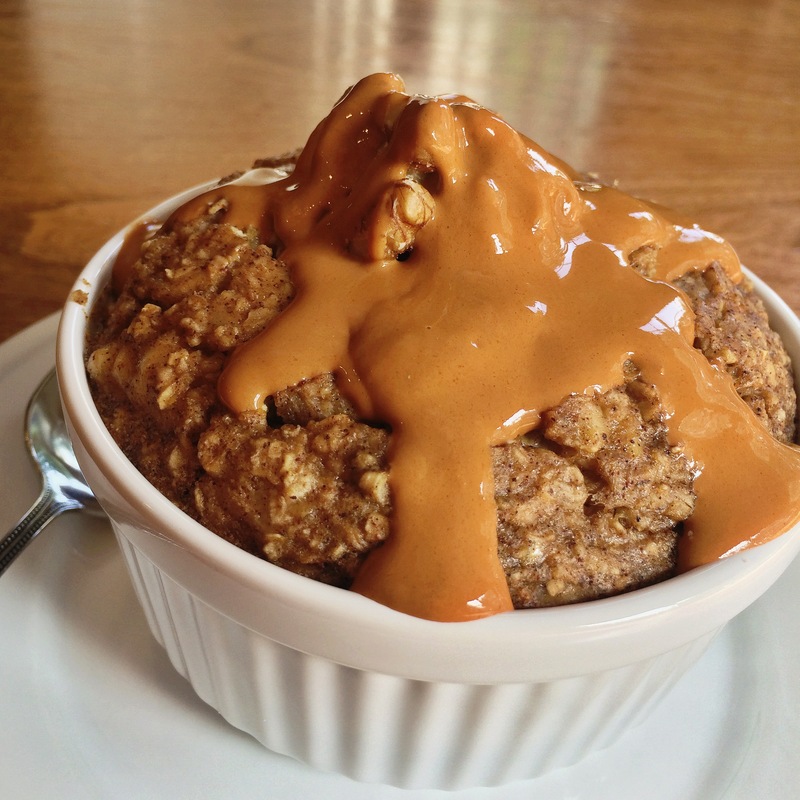 Remove baked oatmeal from the oven and drizzle with warmed caramel syrup. Bon appétit! Oh my gosh… I can’t handle these photos! Hi Sarah! Thank you so much! Have you tested out any recipes that you like yet? Thanks, Sarah! You should try it out! It is so simple and delicious. 🙂 Let me know what you think!